A couple of weeks ago, I went to 360iDev, an iPhone/iOS conference that has been going on for a few years now, devoted entirely to iPhone (and now iPad) development. I actually went last year too, and that year had been to WWDC only a few months before. It was my first time at either conference, and I got a lot out of both of them. But the fact that 360iDev can even hold a candle to the flame that is Apple’s flagship developer conference (WWDC) speaks volumes about how great it is. This year, I elected to go to GDC instead of WWDC, but I still wanted to go to a big tech-focused conference, so I went to 360iDev. Both years at 360iDev, I took part in the 360iDev Game Jam. (I also wrote a blog post about the game I made last year, which I then called ColorWheel.) This year, I teamed up with a guy named Levi that I’d never met or worked with before, we managed to make a pretty cool (albiet very simple) little puzzle game in the allotted 12 hours. I’ve tentatively started calling it Cloud Growth. I just finished a write-up of Cloud Growth (UPDATE: I’ve recovered the text from the game jam site, which no longer exists, and posted it below this post. ), including some more details about the game’s development over on the Game Jam website. 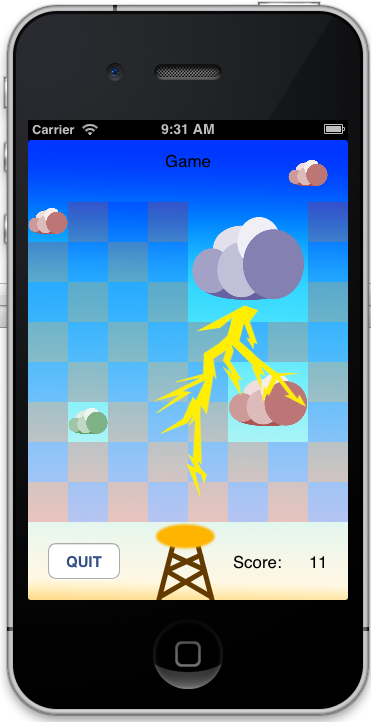 The theme of the game jam this year was “growth”, and our game heavily features clouds, so the naming was not particularly creative. The mechanics aren’t particularly creative either, but I can’t remember playing a game with them before, so I do want to polish this little prototype up, and release it at some point. It feels these days like there’s a game jam every weekend. Last weekend, for example, there was a game jam devoted to making games in the universe of Adventure Time, the TV show. (If I hadn’t been exhausted from a full week of 360iDev, and my lack of sleep that Tuesday night, I’d have been seriously tempted to take part, because Adventure Time is awesome.) A few months back there was a game jam where the participants were supposed to create games inspired by a twitter parody (@petermolydeux) of the relatively famous game creator/producer, Peter Molyneux. I think Peter Molyneux even attended the event! Previously, I’ve also participated in the Global Game Jam. I can’t wait to do more of them. 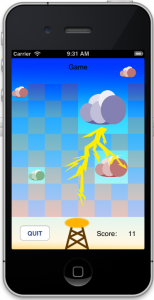 Cloud Growth is a simple action puzzle game collaboration between Martin Grider (@livingtech), and Levi Brown, (@levigroker, blog). We did about ten or twenty minutes of brainstorming, and eventually decided on this concept where we are placing simple clouds on a grid of open sky. There is a cloud “queue” in the upper right hand corner of the screen, so you know what the next one to be placed will be. Clouds have different colors, and if two clouds of the same color are placed next to one another, they will grow into a square of one size larger than the largest sized cloud of the two. You get points for placing clouds, and more points for growing clouds. Martin wrote all of the game logic and most of the view controller code. Part of Martin’s enthusiasm for this particular concept was that he wanted to continue work on a generic GameModel object he’d been writing that abstracts away the “game grid”, as well as touch interactions on that grid. This was a resounding success, and much code was added to that library. Levi did all the artwork and animations. These screenshots do not adequately capture the awesomeness of those animations. When a cloud is placed, for example, there is a really great bouncing effect, that is just fun to see. A good portion of Levi’s time in the wee hours of the morning was spent ensuring that the lightening bolts (currently shown when clouds reach the 3rd largest size), begin at the cloud of their origin, and end at the lightening tower at the bottom of the screen. * Part of the original concept was that the clouds would get removed from the gameboard after a certain threshold, but as the clouds cannot currently grow more than three times, that made the game far too easy. When code is written for larger growth, this idea will be revisited. * Some kind of lightening counter would be fun, maybe with progressively harder levels as the counter is filled.